The blonde Tyrolian Airlines flight attendant pushed a cart with a large basket of freshly baked Brötchen down the aisle, took out two rolls and placed them on a plate garnished with butter, raspberry jam, cheese, smoked meat, and fresh fruit. Clearly, I was no longer on a cheapskate U.S. airline and looking out the window, it was equally obvious that I was no longer in North America. As we flew west from Vienna toward Innsbrück, 20,000 feet below were dozens upon dozens of chairlifts, gondolas, t-bars, and trams draped across the snow-covered mountains, all the way to the horizon. While waiting at the luggage carousel a half hour later, I thought about the months of preparation that had gone into this visit: my first winter trip to the Alps. The previous fall, I’d spent countless hours paging through books, magazines, and online articles about the gigantic resorts there. I quickly realized that the only thing more frustrating than not having enough choices was having too many. Switzerland, France, Austria, or Italy? Above the tree line or below? A mammoth world-renowned tourist destination that would take weeks to ski out or a smaller one frequented predominantly by locals? Ultimately, the descriptions of atmospheric-rich Austria — which looked exactly like the Alps that we’d always envisioned — and an inexpensive airfare/hotel/rental car combo sealed the deal. Thus, we had a target country and soon after, a headquarters in the medieval town of Kitzbühel. Like any decision in life, there were pros and cons to this one. I knew in advance that the Kitzbühel Alps were big and dramatic, with most of the lift-served ski areas offering continuous vertical drops of 3,000 feet or more. At the same time, I was also aware that the mountains in this region are at a comparatively low elevation, which can negatively affect the conditions that late in the season, especially on slopes leading down to the villages. Strictly from an altitude perspective, you could classify Eastern Tirol (for some reason, it's spelled "Tyrol" in English) as the northeastern U.S. of Austria and a good example of a region that you shouldn't book far in advance, especially for an arrival in early spring; however, as mentioned earlier, there’s nothing second-tier about the size of the lift-served mountains. Moreover, since this was a couple’s exploratory trip, my wife argued that the charming villages, easy access to many ski areas, and extensive snowmaking coverage outweighed any potential issues with conditions. After driving off in our rental car, we headed east on Autobahn 12 and an hour later were at an outdoor café in the center of Kitzbühel seated behind strong cups of coffee and enormous pieces of apple strudel. In our jet-lagged condition, we watched members of Europe's Germanic aristocracy stroll by, clad in furs, diamonds, expensive shoes, and “what-me-worry?” expressions on their faces. For those used to visiting purpose-built winter resorts that specialize in facilitating the coming and going of skiers and snowboarders and are often utilitarian in appearance, Austria will be a revelation. An overwhelming majority of the ski resorts there are integrated into villages that have been in existence for centuries. While driving through the picturesque countryside, one beautifully preserved rural community after the next passed outside our windows. Even the newer buildings had been designed to visually integrate into the traditional Tirolean architecture. And while tourism is a predominant economic driver in this region, the towns and rural areas continue to be real working places. With spring approaching, we frequently found ourselves driving behind tractors pulling a wagon of aromatic cow manure. People who’ve never skied in the Alps often ask about the prime differentiator between North American and European skiing, and it doesn’t take much thought to provide an answer. Because the uphill access isn’t owned by one company that refuses to collaborate with neighboring ski areas, a large percentage of the lift-served mountains are interconnected, so instead of yo-yoing the same chairs and terrain over and over, you have the incredible experience of skiing from one village to the next. Many of the individual areas are big enough to keep a motivated skier busy for several days or even a week at a time. If having so many huge ski areas in such close proximity isn't enough, you can buy multi-resort ski passes not only for the entire season, but also for shorter periods. For example, the Kitzbühel Alps All-Star Card covers eastern Tirol and the western Salzburg province, including Saalbach-Hinterglemm, the Wilder Kaiser Ski World, and the Wildschönau Ski Jewel (all covered individually below), along with smaller areas at Fieberbrunn, St. Johann in Tirol, Zell am See and the Kaprun glacier. Several of the latter mountains were on our itineraries as potential day trips, but ultimately had to be abandoned due to time constraints and could only visited as drive-bys. Together, the ten resorts on the Kitzbühel Alps pass total more 600 miles of marked trails, which doesn’t include countless acres of off-piste. Like pretty much everywhere in the Alps, you’ll run out of time well before you run out of terrain to ski. In addition, we quickly realized that even the smallest mountains were as well equipped as the big shots — high-speed lifts and/or gondolas, RFID pass systems, and full-service mountain restaurants (with food offerings that put U.S. ski areas to shame) — but many also offered impressive vertical drops. We kicked off the six-day ski safari with Kitzbühel, which has instant brand recognition amongst the skiing public thanks to its renowned World Cup downhill race course: the Hahnenkamm. 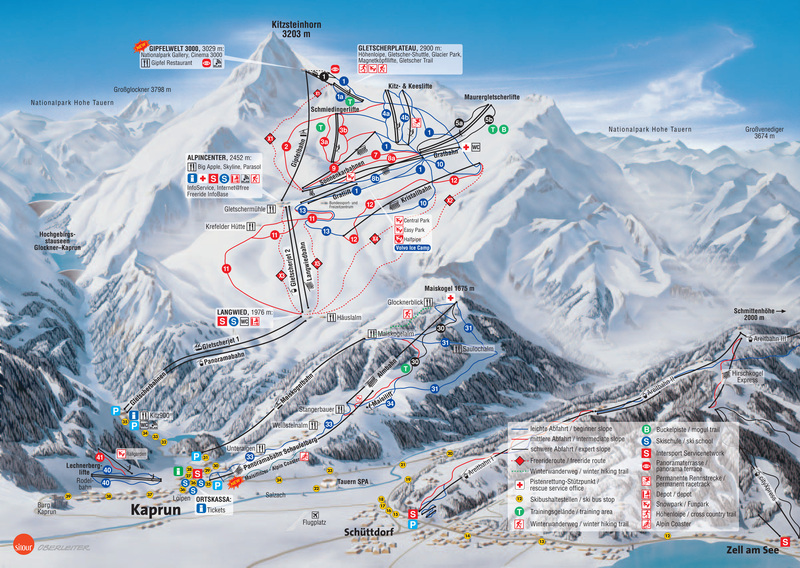 People from around the world make a point of visiting Kitzbühel based on that attraction alone, but the ski area (map) is impressive in its own right. Despite the Hahnenkamm's reputation as one of the toughest downhill race courses in the world, the resort's on-piste terrain is especially well suited for beginners through upper intermediates. In addition to lots of rolling cruisers, there is, as this article points out, a mind-blowing amount of off-piste that can be sniffed out with a guide. Since our visit in 2003, the 3S tram — which many compare to Whistler's Peak-to-Peak gondola — now carries skiers across a huge wooded gorge in the middle of the resort. Most people start the day on the north end of the ski area, Kirchberg, and slowly make their way through several different sectors before arriving on the less populated, higher-elevation (more snow-sure) south end of the circuit, Resterhöhe, 11 miles away as the crow flies. U.S. lost ski area freaks will be interested to know that this sector is a short distance from the village of Mittersill, for which the eponymous ski area next to Cannon Mountain, New Hampshire is named. Across the valley is the Kitzbüheler Horn, offering 3,000+ vertical feet on a south-facing exposure, along with Bichalm, which was transformed into a cat-skiing peak a few years after our visit. At that point in the season, Kitzbühel's low elevation ensured that a quite few bare spots had developed on the lower slopes, but nothing that couldn’t be skied around. And after clicking out of your skis at the end of the day, there's a textbook Tirolean town at your disposal featuring great upscale eateries and watering holes, dozens of boutiques, cobbled streets, no cars, and a wide array of accommodations ranging from spartan and affordable to insanely posh and out of most people's budgets. “Ski Circus” is a popular term in the Alps, meaning that you can circle a large lift-served region in one or both directions. 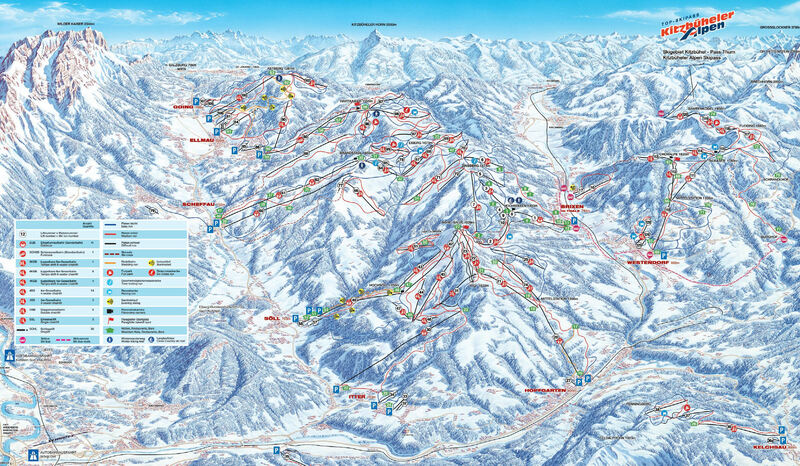 As such, Saalbach-Hinterglemm (map) is one of the bigger ones in Austria, and without question the most popular. I read somewhere that after the capital of Vienna, it’s allegedly the second most-visited tourist attraction in Austria. The resort is based on two villages at opposite ends of a box canyon that have, over the years, almost grown together. Saalbach is the more charming one, with a pedestrian-only town center and numerous atmospheric eateries and bars. They’ve done such a great job of creating infrastructure that looks a lot older than it really is; you’d never know that a fair portion of the buildings were built over the last few decades. The ski area’s predominantly intermediate terrain (120 miles of marked trails), dozens of traditional mountain restaurants and huts, and a higher percentage of high-speed lifts than anywhere else in the Alps appeal to families and the raucous, mostly German, Dutch, and Scandinavian clientele. While there weren't too many expert skiers during our day at Saalbach-Hinterglemm, we ran into a considerable number of expert partiers. The valley gets a decent amount of precipitation every season, but being both low altitude and half of it facing directly south, snow preservation is not a strong point, hence the resort's impressive battery of wall-to-wall snowmaking. Although, at that point in the year, the south-facing trails were mostly burned off, we had a great day there and would love to return mid-season to ski the entire circuit. An interesting cultural side note is the Cirque du Soleil-esque clown persona that's prominently displayed on the resort’s website, print collateral, gondolas, and marketing video. Obviously playing off the resort's "ski circus" theme and family-centric focus, I'm reasonably sure that this type of cutesy imagery — the British have an apt word for it: twee — would not go over well in the U.S. On the other hand, given Saalbach's incredible success as a resort, who are we to throw stones at a winning formula? 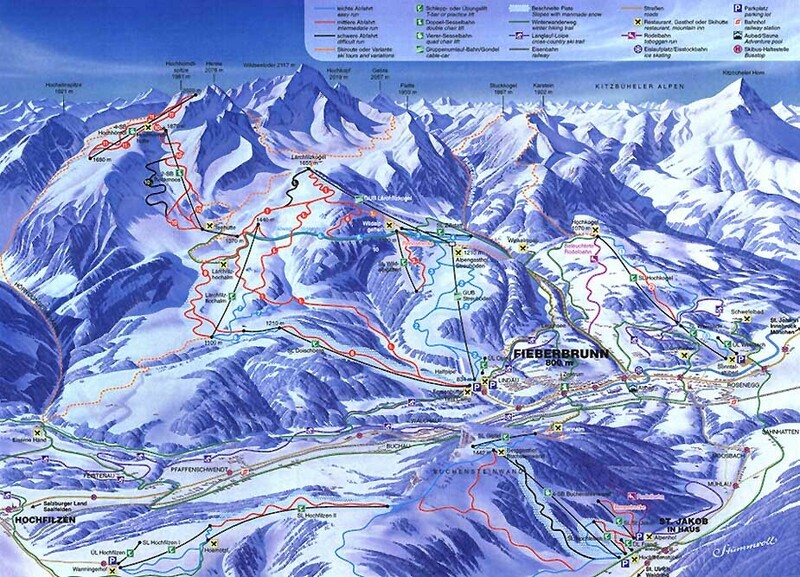 Next up was the expansive Wilder Kaiser Ski World (map). With 167 miles of marked trails connecting eight resort villages, it’s Austria’s largest interconnected ski area and a very popular destination for weekend warriors from Bavaria. Composed primarily of rolling intermediate terrain draped over mountain pasture land — I saw several livestock holding pens — my cruiser-loving wife was truly in her element zipping from one village to the next (promotional video), including Hopfgarten, Ellmau, and Brixen. We also enjoyed hanging out at Hohe Salve’s summit lodge, one of the Ski World's alleged 70+ (!) on-mountain restaurants and huts, where you can admire 360-degree views of the region. While a good portion of the runs seemed to be in the 1,000-vertical-foot range, it was possible to ski 3,000 verts on several runs all the way to the valley floor while gazing longingly at all sorts of opportunities for glade skiing that would have been available earlier in the season. We spent the following day at the resort of Westendorf. With a handful of gorgeous top-to-bottom runs (3,300 vertical feet), some nice off-piste, and a charming village (voted Europe’s most beautiful in 1998), Westendorf is without question the place we'd use as a headquarters for a return visit to the Kitzbühel Alps. Since our 2003 visit, they installed a gondola that provides direct access to the Ski World (eliminating the need for a short bus ride); however, due to its position, tucked away in a corner of the larger circuit, the mountain still gets less traffic than the main part of the ski region across the valley. To wrap up our visit, we spent two days on the western edge of the Kitzbühel Alps region at two smaller resorts, Alpbach and Wildschönau (map). Located less than an hour from Innsbrück, you'd never know it from their quiet, uncommercialised nature, and reasonable prices. What the mountains lacked in on-piste challenge, they compensated with atmosphere. Especially noteworthy is Alpbach, a stunningly cute, traditional Tirolean village whose anti-resort ambiance is a big draw for British skiers; several of whom told me that they'd been going there exclusively for years and sometimes decades. Like most of the mountains on this trip, Alpbach featured mostly intermediate terrain with lots of opportunities for fun in the off-piste, a gondola that covered well north of 3,000 vertical feet, and a cute summit lodge with outdoor seating. We also saw quite a few people skinning up to sidecountry shots. Wildschönau consists of two larger sectors, Niederau and Auffach, which are connected via a ten-minute bus ride, along with several small beginner areas. Niederau had what appeared to be the best variety of terrain, including a few nice long black trails and a wooded gorge; however, most of the snow had already burned off due to its low base altitude. Meanwhile, Auffach was a more wide open intermediate affair that included a nice long 3,500-vertical-foot descent, beautiful scenery, along with the obligatory summit lodge designed in a classic Tirolean style. An important side note: when we were there ten years ago, Alpbach and Wildschönau were two completely separate ski areas. The community leaders of deeply religious Alpbach had made clear decades earlier that they had no interest in transforming the village into a major resort; however, after more than a decade of negotiations, they were connected last season by a gondola, resulting in 87 total miles of marked trails and a newly branded region: the Ski Jewel (resort video). The expansion has, by all accounts, been a big success. Visiting a low-altitude region like the Kitzbühel Alps in late March is definitely a non-traditional (i.e. potentially risky) move. While there was more than enough to ski during our stay there, conventional wisdom dictates that it's advisable to schedule a transatlantic trip there earlier in the season to be able to take advantage of better conditions and the completely deserted off-piste, most of which is ignored by the intermediate-heavy clientele that this region attracts. Still, it was a perfect introduction to the charms of Tirol and the advantages of skiing in the Alps. While flying back from Europe, we flew parallel to the St. Lawrence River and later the Hudson River the entire way south into the New York City region. Passing over dozens of ski areas from the Gaspé Peninsula of Québec down to the New Jersey state line, our only thought was a sobering, "wow, they're so... small." Amazingly enough, as extensive as Austria's interconnected resorts are — especially to someone who's only skied in North America — they're still smaller than the big boys in France, Switzerland, and Italy. Thanks for sharing. This is a section of Europe that I have not been to but it looks like fun. Spring skiing at the lower Euro elevations looks more like eastern US skiing. Safer bets for spring are areas like Chamonix or higher elevation areas in Switzerland like Davos or Zermatt if you plan farther out. Thanks for the great report on Kitzbuhel. It brought back a lot of great memories, my wife and I went to Innsbruck for our 25th wedding anniversary in 1989. While there we took the train and went to Kitzbuhel for a day. That day was the highlight of the trip. It was really something special to be able to ski part of the Hahnenkamm course the week after the world cup was there. What a great experience to ski in Austria and enjoy the culture of a different country. That looks like my kind of trip!